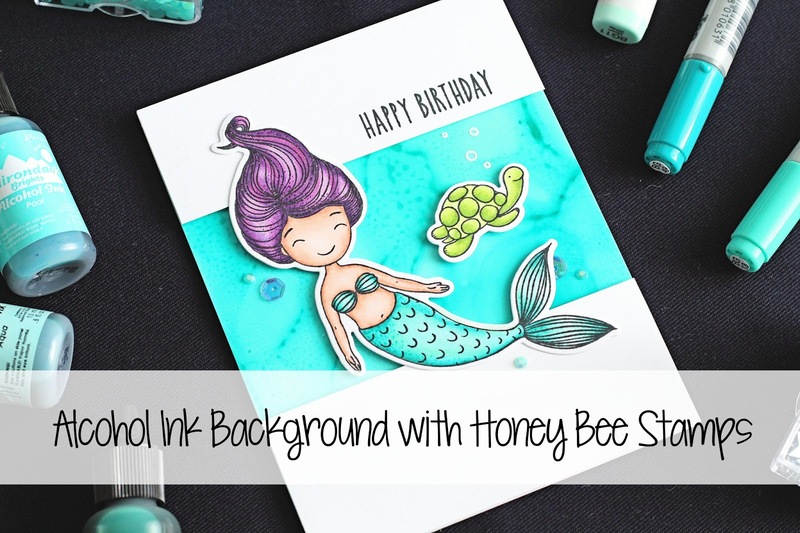 Hello there, today I am delighted to be guest designing with Honey Bee Stamps. I am using the super cute Swimming By stamp set along with alcohol inks to create a fun sea background. To start my card, I took a piece of Yupo paper (a synthetic paper that works really well with alcohol inks) and added on some Alcohol Ink Blending Solution on to it. This helps the alcohol inks to move. I then applied three shades of alcohol ink. I used Mermaid, Pool and Aqua. Since I blended the colours together so much, I probably could have just used one or two but that's ok! Once I had the colour on the paper, I picked it up and moved it so that the alcohol inks ran on the paper. I then spritzed air on to it using the TH Spritzer Tool. I set this piece aside to dry while I worked on my stamping. 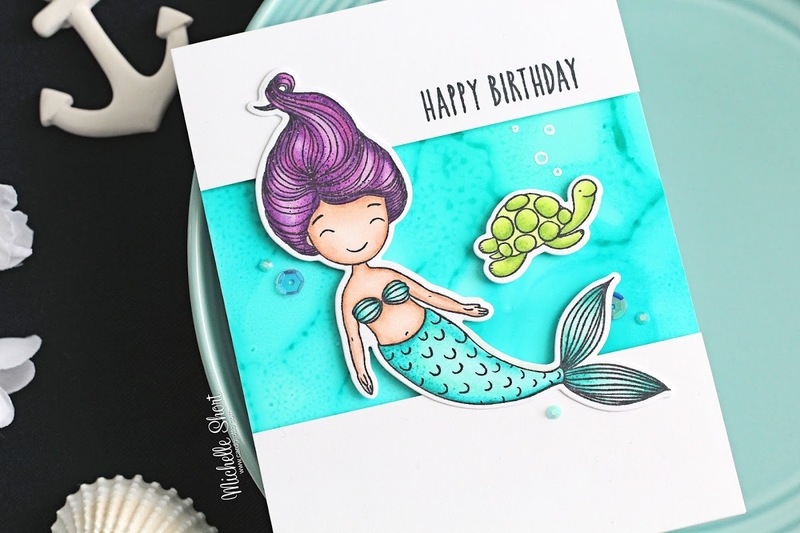 I took the mermaid and turtle from the Swimming By stamp set and stamped these on to white cardstock using Memento Tuxedo Black Ink. I then coloured them using Copic Markers and cut them out with the coordinating dies. I cut my alcohol inked piece down to size and stamped the bubbles from the set on to it. I used Versamark ink to stamp and then applied white embossing powder and heat set. The heat did warp the paper slightly but since I was sticking it down to the card base I wasn't too concerned. After applying the piece to an A2 white card base, I added two strips of white cardstock on top with foam tape. The 'happy birthday' sentiment was stamped on to the top piece with Memento Tuxedo Black Ink. 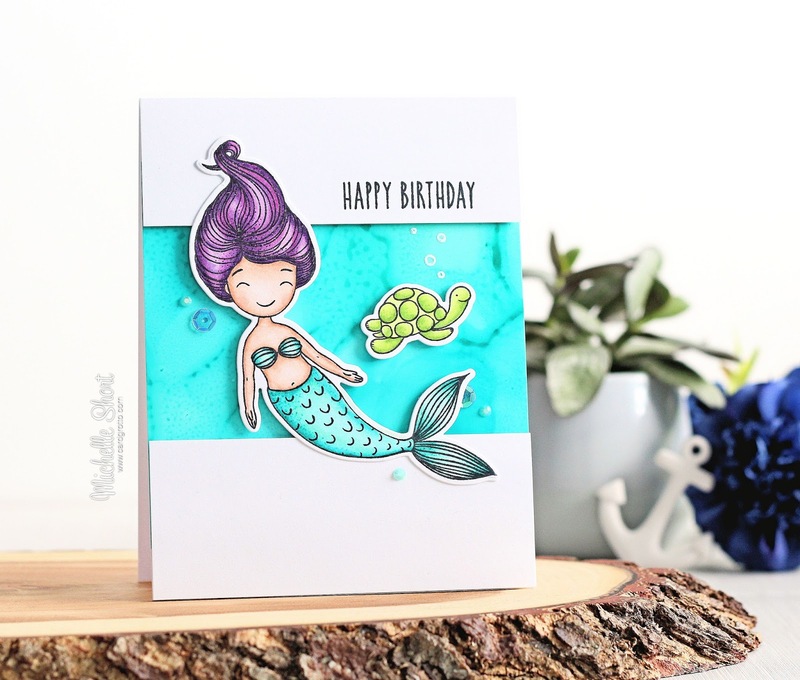 I then added the turtle on to the card with foam tape and the mermaid was added with a combination of foam tape and tape runner. Using Copic At You Spica glitter pens, I added little dots to the mermaid's hair, top and tail. I also added a little on to the shell of the turtle too. To finish off, I added Shimmering Pool Jewels, along with Peacock sequins. COPIC MARKERS: Mermaid skin - E13, E11, E00, E000, E0000, E11. 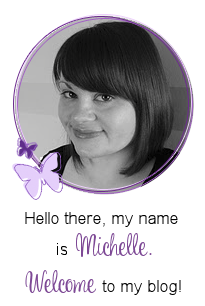 Mermaid hair - V09, V06, V05, V01, Spica 01 Lavender, Spica 13 Lilac. Mermaid Top and tail - BG49, BG34, BG13, BG11, BG10, BG000, Spica 08 Turquoise. Turtle - YG17, YG23, YG03, YG01, Spica 17 Mint. 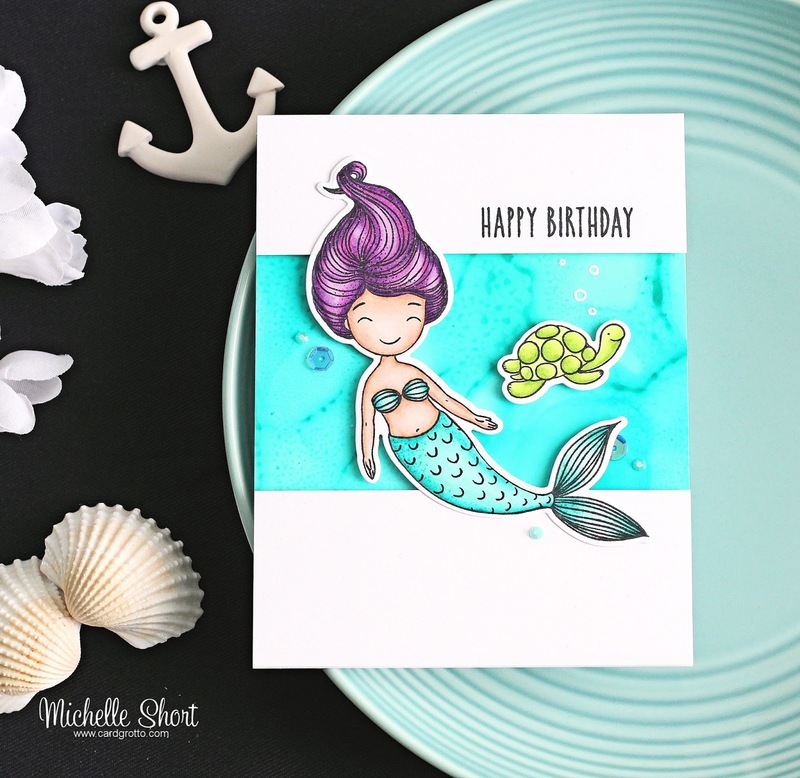 For more inspiration using this set, along with the other sets from Honey Bee Stamps, please head over to their blog. Thanks so much for visiting me today. I hope you have a great day! 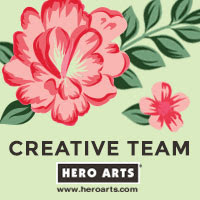 Love the background, it's given me some good ideas of what to do with my homemade alcohol inks.